This is a beautiful log cabin with a large family room with open fireplace and 1 bedroom on ground floor and with extra space on the 2nd level. The basement is half gravel and half cement floor with a bar and partial bathroom. Property has a man-made grill and 2 outbuildings along with a large deck and sun room at the rear of the house. Northeast Bradford El School Elementary School / Public 6 6.57 mi. Northeast Bradford Junior-Senior High School Middle School, High School / Public 6 6.78 mi. Morrow El School * Pre-School, Elementary School / Public N/A 6.81 mi. St Agnes School * Pre-School, Elementary School / Private N/A 6.88 mi. North Rome Christian School * Elementary School, Middle School, High School / Private N/A 6.2 mi. Union Valley Christian School * Elementary School, Middle School, High School / Private N/A 6.2 mi. 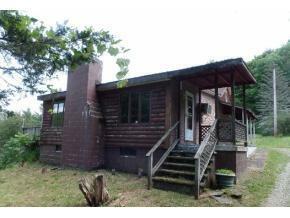 393 Elliott Road, Wysox, PA 18854 is a 1 bedroom, 1 bath single family home was sold for $84,500.